Google Music is a service that allows you to upload up to 20,000 songs which you can then listen from any computer and even your phone, for free. Google Music is only available in the US for now and requires an invitation (you can request an invite from its main page). 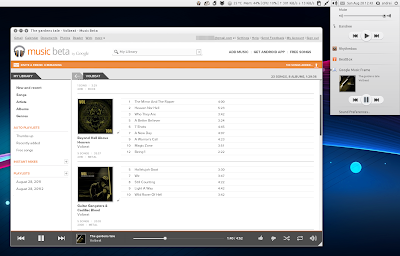 Google Music Frame runs Google Music web interface in its own window and provides integration with Ubuntu (sound menu and notifications). It also remembers last session and the current view (album, genre list, etc.). According to a bug report, it seems the application will also get support for multimedia keys in the future. There's also a daily builds PPA for those who like to try new feature faster (but it's not stable). The daily builds PPA also provides Ubuntu 11.10 Oneiric Ocelot packages. If you encounter any bugs, report them @ Launchpad. Thanks to Jiří for the tip!